This image was generated from the Integrated Multi-satellitE Retrievals for GPM (IMERG) data product. This is the near-realtime "early run" product, which is generated by NASA's Precipitation Processing System every half hour with a 6 hour latency from the time of data acquisition. It is produced using data from the satellites in the GPM Constellation, and is calibrated with measurements from the GPM Core Observatory as well as rain gauge networks around the world. The time shown is the data acquisition end-time, rounded to the nearest minute. 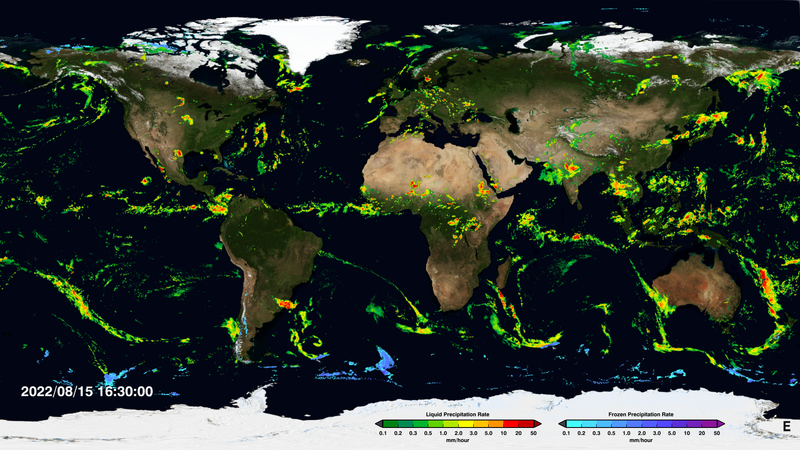 View more global images based on the older TRMM-based Multi-satellite Preciptation Analysis (TMPA / 3B4x).